Oranges and other citrus fruits like lemons, limes and grapefruit are grown in Arizona as commercial crops and for personal use. In colder areas of the state, such as Payson, Prescott, Flagstaff, Show Low and Mount Lemon, deciduous varieties of fruit trees that require a chilling period grow as well. Some deciduous fruit trees will grow and bear fruit in the desert areas of Arizona with proper soil and water. Citrus trees are evergreen and frost tender. They grow from 15 to 30 feet high in a naturally rounded shape. The leaves are oval-shaped and glossy. 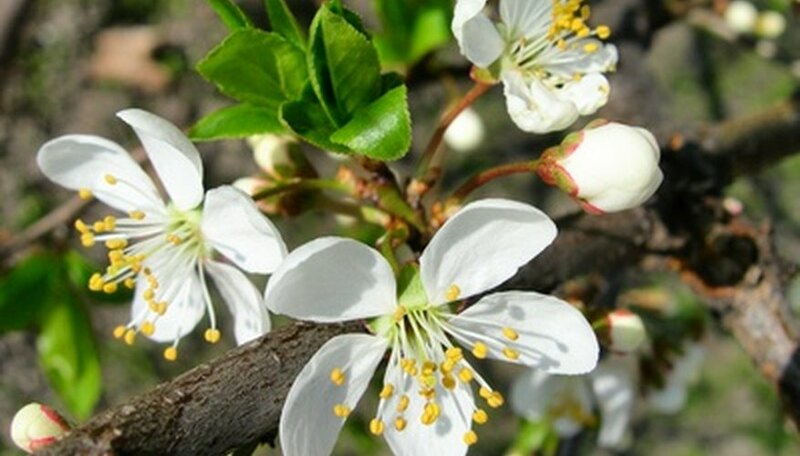 Blossoms are small, white and very fragrant. Most citrus trees have thorns. In addition to oranges, lemons, limes and grapefruit, more unusual varieties of citrus are grown in Arizona, including tangelos, mandarin oranges, Myer lemons, blood oranges and pomelos. Pomelos, for example, are pale green and a relative of the grapefruit. The fruit is white and sweeter than a grapefruit. Fruit trees are sold in containers from 15 gallons to boxes up to 36 inches square. Planting is done at any time but the hottest part of the summer. The best time in Arizona is early spring or fall when the weather is warm enough to encourage root growth before the hot months. Chilling hours are those when the temperature is below 45 degrees Fahrenheit but above 32 degrees F. Most of Arizona isn't a good location for deciduous tree fruits because there aren't enough chilling hours. Fruit trees that require chilling won't bloom or set fruit if the winter is too warm. Higher elevations such as the area around Oak Creek, Sedona and Prescott supports these types of fruits. Apples, pears, cherries and plums all require chilling. Most of these trees grow from 15 to 30 feet high. They bloom before they leaf out with a few exceptions. Although growing trees from seeds is possible, most trees are grafted onto sturdy rootstock. Deciduous trees may be sold bare root while they're dormant. The tree is dug up. Soil is removed from the roots. Roots are clipped and wrapped in a damp medium like saw dust, then wrapped in burlap or plastic. These trees must be planted at the earliest signs of spring right after the average date of the last frost. Fruit trees may blossom the first few years but shouldn't be allowed to set fruit. Remove the fruit so the tree puts all its energy into growing. Peaches with very low chilling requirements will grow and set fruit in Arizona as will apricots, figs, persimmons and quince. Avocados will grow and are very frost tender. Olives are fruits that are produced mostly for their oil. They must be treated before they're consumable as olives.